The 25th symphony of Mozart may not ring a bell for most of us, but Titan’s signature tune definitely does. And that is good news for advertisers. Ad jingles are blessed with high brand recall and are the one critical weapon in an ad maker’s armoury. Even as they race to create ever-new television commercials for the latest products from brands, they prefer, more often than not, to retain the decades-old jingle that generations have identified with the brand. For instance, Britannia Industries Ltd, a biscuit company, ends every one of its high-profile ad clips (featuring cricket icon Sachin Tendulkar) with its trademark jingle tintin dri tin; Intel Corp. commercials, from the Pentium III clip to the Core 2 Duo processor ad, all carry the five-note Intel Inside sonic logo; the list goes on. Some date back to the 1980s: the Titan melody, the Liril soap tra la la, or the patriotic pitch of Bajaj scooters, Hamara Bajaj. The jingles that have struck the right chord have amassed a wealth of brand recall. As with Mozart, few associate 19th century Spanish musician Francisco Tarrega with the guitar piece that is the Nokia hallmark. Adopted initially for the 2100 handset series in 1994, Gran Vals was registered as the Nokia tune in 1998. Bharti Enterprises Ltd took audio branding to another level in 2002, when it signed on celebrity composer A.R. Rahman to write an exclusive tune for the Airtel brand, and then wove the entire ad campaign around the making of the jingle. The dividends in terms of audio branding and brand recall were high. “When you hear the Rahman tune, you know it’s Airtel," says Hemant Sachdev, group director, brand & communications, Bharti Enterprises. All later commercials for Airtel tuned in to the Rahman cue for maximum effect. “The Airtel signature tune is integral to the visual campaign in communicating who we are, what we do and why we matter," says Sachdev. Other cellular service providers such as Vodafone (earlier Hutch) and Idea Cellular have also adopted jingles to bridge the ad clips of their various offerings. A catchy jingle can sway the world, cutting across cultures and geographies. As McDonald’s Corp. found when it adopted the I’m lovin’ it jingle. “Way back in 2003, McDonald’s unveiled the global campaign, unifying all the markets under a singular brand signature line," says Jyoti Rakheja, head, marketing and corporate communication, McDonald’s India (North and East). The company says it has seen a significant increase in sales since then. McDonald’s success underscores the fact that a good sound is good business, say brand consultants. 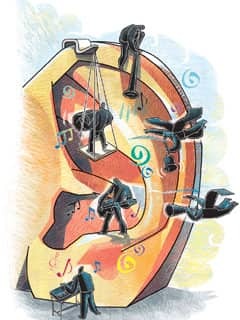 “Sound has an immediate and direct impact on our minds," says Ramesh Jude Thomas, principal executive officer, Equitor Consulting, a marketing and branding consultancy. “And for those in the business of creating perceptions, the opportunity lies in linking brands and their values through the strategic use of sound." It was one strategy that paid off for Whirlpool of India Ltd. The consumer durables company discovered through market research in 1998 that its television commercials were not reaching women, the most critical segment of its audience—they were not watching television during the ad breaks. “Women tend to attend to household needs during commercial breaks, and we were losing out," says Sukhpreet Singh, general manager, brand marketing, Whirlpool. The company then planned a sound mnemonic to go with its campaign in India, “so that women knew that it is Whirpool when they heard the audio tag". And the same jingle accompanies Whirlpool ads even today. Other brands, too, have preferred to reinvent the same tune rather than tinker with the recall factor of audio branding. Over the years, the Liril girls changed, and so did the waterfalls, but the scintillating Liril tune which has come to represent the spirit of freshness for generations of women remains basically the same, with some slight changes in rendition. Similarly, though Titan’s communications changed with its brand strategy, it didn’t trade a 20-year-old property with a strong brand association for something new. “The Titan tune is one of our biggest assets," says Harish Bhat, chief operating officer, watches, Titan Industries. “Like any classic, this sound snippet gives us immense scope to reinterpret it according to the collection and audience. And, every time, it sounds fresh and yet, redolent of the original piece," says Bhat. Parle Agro Pvt. Ltd, too, tweaked its 22-year-old Mango Frooti, fresh and juicy jingle for a more modern rendition, featuring hip hop music. Bajaj Auto Ltd reinterpreted its sweet, familial, Hamara Bajaj jingle to sound more edgy, modern and vibrant to communicate the change in brand and corporate strategy. And more recently, Hutchison Essar Ltd used a peppier, faster version of their You & I jingle to communicate the change from Hutch to Vodafone, which is known globally for its young and peppy brand communication. For Idea Cellular, creating a distinct sound was a strategic element in its communication from the very beginning. The Idea tune, which was created in 2002, has been touched several times over the years to keep it contemporary, yet very recognizable. Says Raj Kurup, chairman and chief creative officer, CreativeLand Asia Ltd, who worked on the Mango Frooti campaign: “We reinvented the tune to reflect a changing India. So the melodic, rhythmic blues have made way for a more modern, hip hop tune." The jingle has transcended its status as a tune and become a brand property. “You can’t let go of something like that," he adds. The only time the brand strayed from its signature tune was in 2001, when it launched the Who is Digen Verma? campaign. Bajaj Auto had also ditched its Hamara Bajaj jingle in 2003, only to come back with a stronger, edgier version early this year. “There is a fair amount of brand equity and recognition associated with a jingle. So, it made sense for us to present it in a more contemporary style, which would communicate change in strategy and also strike a chord of familiarity with consumers," says Amit Nandi, general manager, marketing, Bajaj Auto. While some detractors attribute this old-is-gold strategy to nostalgia and others to deficient creative vision, experts say it works wonders. “Why ditch a property that is so powerful?" asks Harish Bijoor, chief executive officer, Harish Bijoor Consults. This is why firms with great jingles tend to contemporarize what Bijoor likes to call their “forever jingles". But, the golden goose could also end up as a “golden noose". “Sometimes, a great jingle can also be creatively stifling for the brand," says Ram Sampath of The Mint, a Mumbai-based music production house. “It’s really hard for brands to give up something that has been successful for a very long time," says Sampath. “But if the jingle has stopped working for the brand, it’s time to ditch it," says Bijoor. While jingle recycling might have its critics, audio branding as a concept is gaining popularity—especially with the growing popularity of radio and cellphones. “The 24/7 devices are capable of taking audio branding to a different level altogether," says Prateek Srivastava, group president, South, Ogilvy & Mather. “The key is to use sound intelligently and not make lazy approaches," adds Srivastava. Also, the exponential increase of brand touch points over the past several years has forced companies to invest more time, money and energy in search of compelling mnemonics to find a space in the minds of today’s consumers, who have more distractions than ever before. “As we go mainstream, we would look at humour, minimalistic storytelling, (and) then audio will be used to accentuate it," says Shashi Sinha, executive director, FCB-Ulka. With increasing use of websites, mobile phones, ATMs, PDAs and countless other devices—and as convergence in multi-media devices moves forward—companies will use sound more than ever for branding and improving consumer experience. The changes in retail environment, too, will see companies seeking to create a complete brand experience by using sensorial branding—branding based on visual, audio, tactile and olfactory experiences. The future will see telecom companies looking at tie-ups with, say, an FMCG or retail brand to advertise on its recharge coupons or offer discounts, or not charge customers for a call for listening to an ad jingle before a phone call. “We believe in looking forward to great opportunities. We want to create channels on mobile phones and generate both differentiation and revenues from it," says Sachdev. It only makes sense for companies to use audio branding to create better value for their communication investments. A strategic approach to audio can provide the economic value that a company might have been missing out on. Mozart’s 25th symphony, used by the late Suresh Malik in 1986, has been adapted for almost every collection the brand has made. It used an electronic, funky version for its Fast Track watches; a mellifluous version for the first Raga ad featuring actor Rani Mukherjee; a festive version featuring actor Aamir Khan, who also hummed the jingle for one of their campaigns. At Titan Industries, reinventing their signature tune is a matter of strategy. “While the original jingle creates a strong association with the brand, it would be boring in today’s context. The jingle is reinterpreted to suit the consumer segment we are trying to reach," says Ajoy Chawla, associate vice-president, Titan Industries. The Airtel tune has become the world’s most popular mobile music, with more than 45 million downloads. The original tune has been reorchestrated several times to suit the tone of the commercial. One ad, featuring actor Shah Rukh Khan, even used a whistle version. Thirty minutes—that is exactly how long it took music director and composer Rupert Fernandes to come up with the original Hutch tune. And everyone chipped in with words for the ‘You & I’ jingle. That was four years ago. So, when it was time to switch to brand Vodafone, the team was clear that it would use the Hutch pug as well as the jingle. Inspired by Irish folk music, the new version is celebratory and connotes a new beginning, says Fernandes. It took the team precisely two hours to string the new jingle together. “The jingle was tweaked a bit to sound more young, energetic, fresh and happy," says Rajiv Rao, group creative director, O&M Mumbai. For most of its 28-year existence, Liril, the soap brand from Hindustan Unilever Ltd, has been identified with its ‘La laa laaa la la’ jingle, composed by music director Vanraj Bhatia, and immortalized by the brand’s iconic girl-under-the-waterfall-imagery created by ad guru Alyque Padamsee. The only time the brand moved away from its trademark jingle was in 2004, with its ‘Oof–Yu-Maa’ campaign featuring Deepika Padukone. Agency McCann Erickson (India) Pvt Ltd is now working on a new campaign that is rumoured to have all the elements of the original—waterfall, bikini babe, jingle et al. “The brand had a glorious past, and I’m not about to throw the baby out with the bath water," says Prasoon Joshi, executive chairman and regional creative director, South and South East Asia, McCann Erickson (India) Pvt. Ltd.